Sometimes I cajole and threaten my kids to go outside. They are so enthralled with their electronics that they often do not see the sunshine. But sometimes they jump right up to play a game of bump. I know it has not been the sunniest of winters, but the sun has shined now and again. When it has been sunny for more than a few minutes, I have gone outside to enjoy it with a run or playing basketball. Yes, I have wimped out due to the temperature or rain, but on those occasions when it is fairly nice, I go. And I want my kids to join me in the sunshine. Whether I am going on a run or going to shoot hoops, I usually ask my kids to join me in my outdoor activity. They usually dismiss the option out of hand, and sometimes they think about it for more than a second before dismissing the idea. But on occasion, they actually do join me. I am always gratified when they do. Unless we end up playing bump. Actually, I enjoy bump. It is a silly game, but it is enjoyable. Especially, since there is the chance that the most skilled person will not always win. 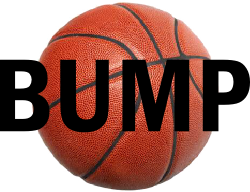 Bump is a basketball-like game. You use two basketballs and the free throw line. And two or more people can play it. The object is to be the last shooter standing. Two people start with the two balls. One person lines up at the free throw line and the other lines up behind him. As soon as the first person shoots, the second can fire away. If the first shooter makes the shot before the second, he retrieves the ball and gives it to the next person in line. If not, he keeps shooting until he makes it (giving it to the next person in line) or until the second shooter makes it first. If the second shooter makes the ball in first, the first shooter is out. The next players line up at the free throw line and start the next round with one less person. You would think that the person who is a great free throw shooter would tend to be a great bump player and it can be true. Unfortunately, when the first shooter lines up and takes a free throw with a nice arc, the second shooter can send a shot with a low fast trajectory and either bounce the first ball away or get the shot in before the first shooters ball descends from its flight path. That is one of the fun and frustrating parts of bump. Yesterday, we played bump for hours. I was throwing up great free throws and should have won every round, but Thing 2 and Thing 3 kept throwing up shots that would knock my ball away or get in before mine. Or they would throw up shots that got knocked in by my ball. Thing 3 especially liked going second when I was starting so that he could do just that. He did it more times than I would have imagined possible. Still, I could not or would not change the trajectory of my shots. I made lots of free throws, but I also had a lot rejected by the missiles the boys were firing. While getting ugly shots to go in before or with the help of beautiful shots had great entertainment value and caused much laughing, the part of bump that is most enjoyable is actually where the game gets its name. As anybody who has ever missed a basketball shot knows, the ball bounces away in a predictable manner. However, when playing bump, the other shooter can make those bounces less predictable. As long as a shooter has his own ball, he can bump the other shooter’s ball away. Sometimes far away. Being the youngest, sometimes Thing 3 does not use his ball like he is supposed to and just hucks the other person’s ball away. Usually over the fence which is behind the basket. Then, he takes his time lining up the shot while the other shooter runs to get the ball. Even though he breaks the bumping rule, it is too much fun and we laugh too much to tell him to stop cheating. Bump is a great game of shooting, running, and laughing. We have a blast. Probably because the game does not always go to the best shooter or fastest runner. And nobody really keeps track of how many times each person has won anyway. When the last man is standing, we just line up and start again. It is great fun. I know that the kids do not jump right up to go outside with me. In fact, I am sure I will still need to cajole and threaten them to abandon their electronics from time to time even when the sun is shining. Still, I am glad to know that even when the electronics call, we can all go outside and enjoy a good game of bump.